StudioCanal UK have announced that they will be releasing the first ever full restoration of Robin Hardy’s cult classic The Wicker Man on DVD and Blu-ray for the first time, following a cinema reissue, in celebration of the film's 40th Anniversary. If, by some misfortune, you've never encountered this giant among cult films, then a brief synopsis is in order. Brilliantly scripted by Anthony Shaffer (Sleuth, Frenzy) and featuring a career-best performance by the legendary Christopher Lee, director Robin Hardy’s atmospheric use of location, unsettling imagery and haunting soundtrack gradually builds to one of the most terrifying and iconic climaxes in modern cinema. StudioCanal have been conducting an extensive worldwide search for film materials for The Wicker Man for the past year, including a public appeal to fans for clues as to the whereabouts of the missing original cut. Eventually a 35mm release print was found at Harvard Film Archives which director Robin Hardy has confirmed is the cut he had put together with distributors Abraxas in 1979 for the US release. This has been scanned at 4k and used to create the first ever full digital restoration of the film, with Robin Hardy's guidance. Robin accepts that film materials for the fabled Long Version or "Director’s Cut" will probably now never be found. "Sadly, it seems as though this has been lost forever. However, I am delighted that a 1979 Abraxas print has been found as I also put together this cut myself, and it crucially restores the story order to that which I had originally intended. This version of The Wicker Man will (optimistically!) be known as The Final Cut." When asked whether this cut measures up to the fabled original, long version, Robin Hardy puts it most succinctly: "The film as I saw it in the editing suite the other day fulfills my vision of what it was intended to convey to the audience." 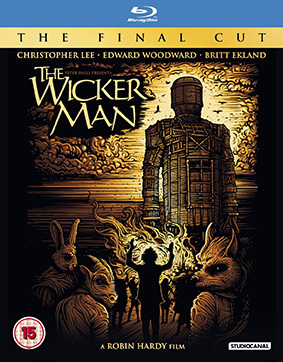 The Wicker Man: The Final Cut will be released on limited edition UK 3-disc Blu-ray and 4-disc DVD on 14th October 2013 by StudioCanal UK at the RRP of £29.99 for the Blu-ray and £24.99 for the DVD.